Previously, Sunset Memorial Gardens, Sunset Gardens has been serving the Tri-Cities and surrounding areas since 1958. 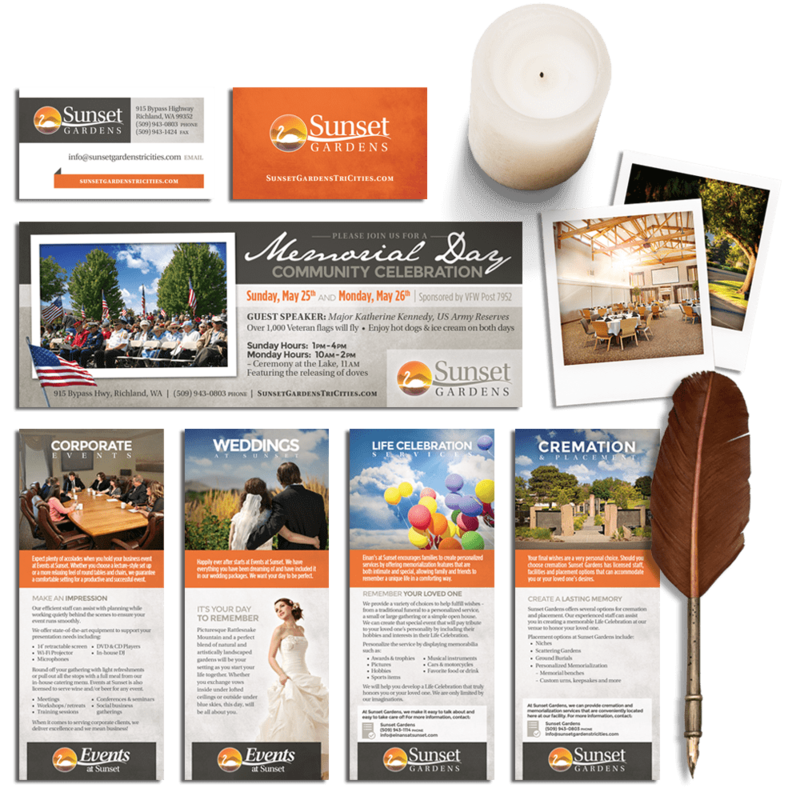 The beautifully landscaped non-profit cemetery owns Einan’s at Sunset, previously Einan’s Funeral Home, who in turn owns Events at Sunset, previously Memories at Sunset Event Center (a modern event center catering to the other entities). Sunset Garden is an established namesake in our community and has a great reputation for the highest level of service in the funeral business. Our job was to help them establish an internal and external brand hierarchy so that it would be clear what each entity offers their customers while maintaining the strong reputation of the Sunset Gardens name. Through research and much deliberation, we found that using Sunset Gardens as the overarching parent brand was the optimal name change they needed. It was shorter and simpler, and frankly, more memorable. Subsequently, the brand extensions or sub-business lines were named Einan’s at Sunset, Cemetery at Sunset, and Events at Sunset. This subtle name adjustment helped clarify each entity’s role while offering a family of brands that worked together harmoniously. 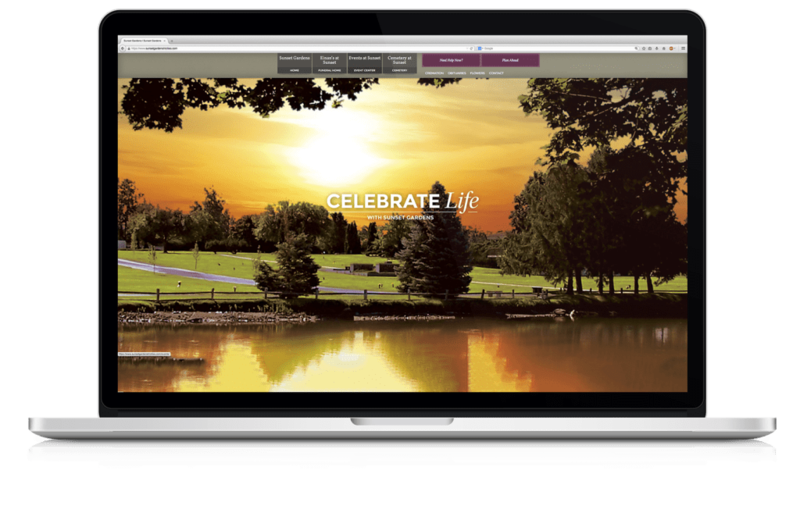 Once the naming and brand was complete, we turned our attention to developing a marketing plan that addresses all the fast-changing trends that are happening in the funeral home industry. We conducted extensive research on the Sunset Gardens business – everything from their inner workings, to their functionality, to their marketing efforts, as well as what their competitors are doing in all facets. Focal Point’s research findings of the funeral home industry on the national and regional levels led us to draft an integrated marketing and advertising strategy for the coming year. This strategy would dictate everything from how and where to advertise, what marketing collateral to produce, what demographics to market to, and much, much more. Understanding that their website was going to be their most important marketing tool, Sunset Gardens asked us to re-haul their online brand. They needed a website with upgraded usability and SEO capabilities, dynamic content, a responsive/mobile-friendly design, and unique features, like a guestbook and e-commerce component for ordering flowers for deceased loved ones. Using the new brand consistently across the board was imperative to get the best results. The general public responds well to brand consistency – there’s a level of trust and understanding that people grow to know and expect. No surprises. And there’s comfort in that. These are the qualities and measuring sticks of a successful brand, and Sunset Gardens is set up for success.